Isaac's blessing was a lot of fun, but also very hectic as well! 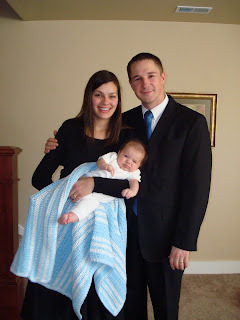 We decided to combine with Josh's brother who also had a baby two weeks to-the-day after Isaac was born. 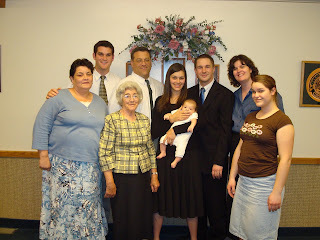 With three families combining together and one of them being Josh's family we had well over 70 people there. I guess that in the church hand book it says to bring your baby before a body of the church to be blessed and Josh's brother Johnny pointed out that this was a body of the church! 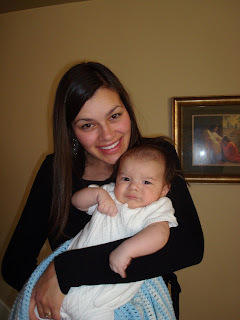 I prayed and prayed that Isaac would not cry through his blessing...and on cue, right at the end of the blessing Isaac began to cry. Josh and his brother Danny joked that it was due to the high velocity bouncing arms of the 13 men surrounding the circle. 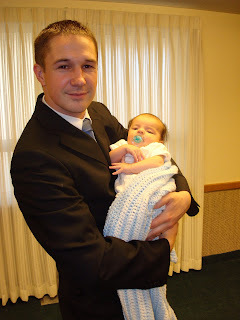 I had to take Isaac out for his cousin's blessing...not just out in the hall, but OUTSIDE where his crying wouldn't disturb the reverence. That kid has got a good said of lungs. Like mother, like son as the saying goes I suppose. All in all the blessing was an incredible experience. 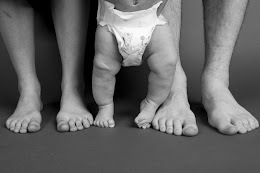 Josh and I have blessed our first baby... Definately a milestone on our path to raising up a righteous family. 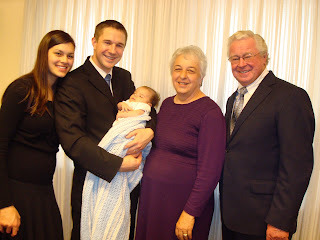 My grandma came down for the occasion and we were able to get a four generation with her, my dad, Isaac, and myself. 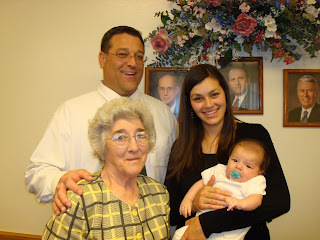 Isaac is the first great grand baby on my dad's side and that was a neat experience to watch my grandma holding him. 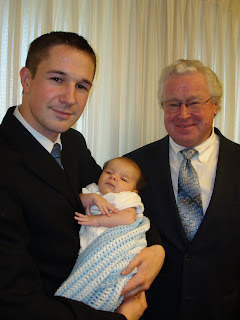 Here is Josh, his dad, and Isaac in a three generation picture. Here is the four genereation picture. I got one of these with my dad, my grandma, and my great grandma when I was a baby, so I really wanted to get this one to match it. And this one was just for kicks. I don't know if you have noticed in the pictures yet, but Isaac came out bald on the top with tons of hair around the sides. Everyone calls him the "little highcouncil man." 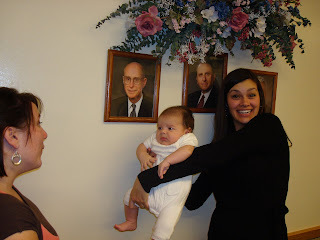 We decided to get a picture of him with Henry B. Eyring who shares a similar hairstyle. Grrr I figured out how to leave a comment! He's SO CUTE MARY! Congrats to you and Josh! Hey cute girl!! Isaac is getting sooo big! What a babe. Yay! Love your blog and funny stories! How fun to see your whole family again. Ummmm ... Rick is making your dad look short and I KNOW he isn't! YIKES and away!